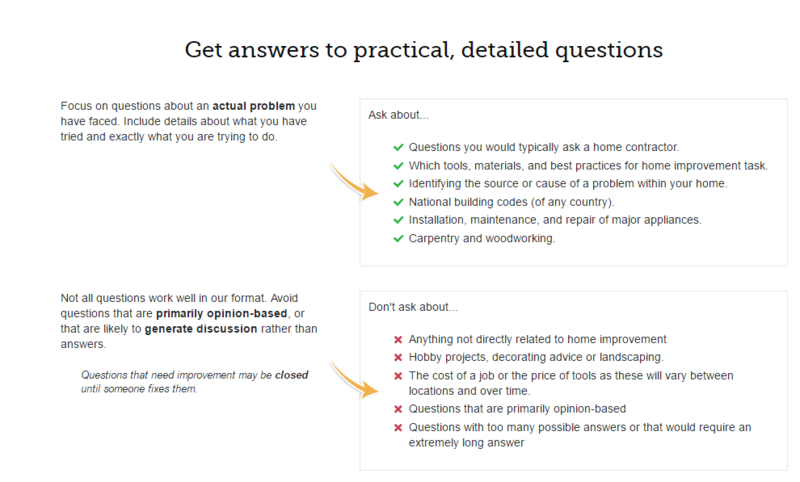 I suspect it's leftover from before the woodworking site launched, but given that woodworking does exist, the tour for this site shouldn't encourage users to post questions which would be more suited for another site. On a related note, perhaps it would be helpful to point out other SE sites where questions that are off-topic here would be on-topic. For instance, gardening & landscaping for landscaping, arts & crafts for hobby projects, etc. Per the usual division between them, Carpentry belongs here. Though "finish carpentry" starts to get fuzzy, and when you get to the point of built-in furnishings others fuzzier still. It's really more a matter of attitude and context than technique... but it's real, and it affects both where people will look and where they will find the best advice. If it has to be permanently attached to the house to be stable, it probably belongs here no matter how pretty the woodwork. Putting poly on a flourishing improvement. If it is just sitting on the floor, it probably belongs in Woodworking even if it's thrown together from white-wood dimensional lumber. Putting poly on a table is woodworking. Decorating advice, landscaping, woodworking or hobby projects.